Proxemics is the study of how individuals behave in space in terms of proximity-distance. It specifies the distances that people maintain from one another in different situations, thereby communicating with one another non-verbally. Everyone knows proxemics from everyday life, when in a confined space, such as an elevator that forces people to stand close together, people avoid eye contact with the person standing directly next to them. Also at the dentist’s office, you probably don’t look directly into the eyes of the dentist who is right above your face, but instead, at a spot on the ceiling. Physical closeness, the invasion in the realm of our intimate distance, makes us uncomfortable. By averting each other’s eyes, we avoid contact. But the personal sense of how we physically situate ourselves in space depends on environment and culture. 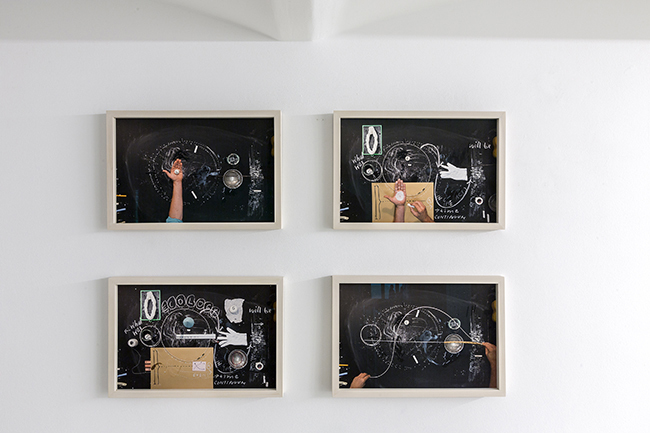 For their “Co-Creation of Space,” Monika Grzymala and Nikolaus Gansterer rely on this specific behavior in space as a communication system, and once again engage in visual dialogue. 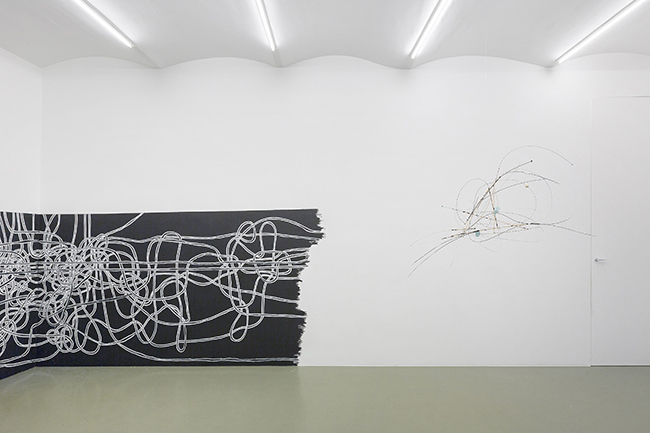 Monika Grzymala and Nikolaus Gansterer got to know each other in the course of the exhibition "Drawing Now" in the Albertina, in which both participated and in which both of were immediately fascinated by the parallels in their works. 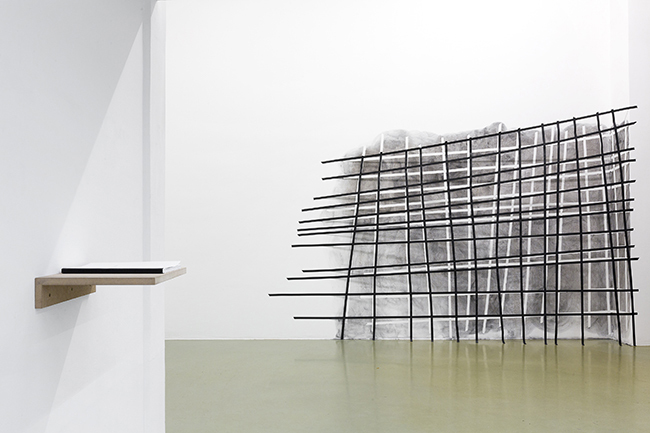 Parallels and commonalities are not immediately apparent to beholders: Grzymala works with adhesive tape, which she stretches through the exhibition space, around columns and on walls, thereby producing her spatial drawings. 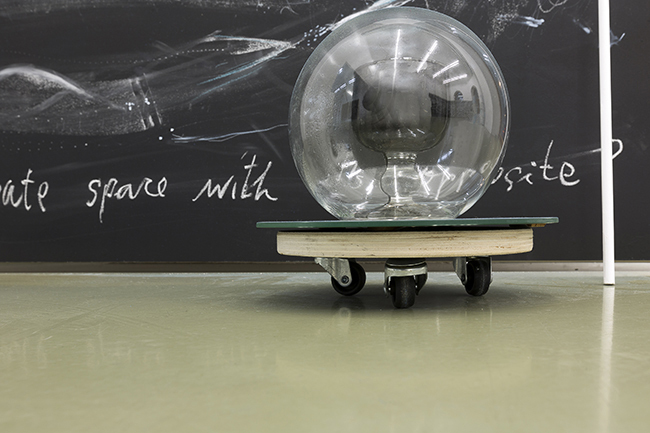 Gansterer, on the contrary, frequently uses lab settings comprising chalkboards or projection screens for his presentations, as well as a desk with various objects—chalk, pencils, ties; and geometric forms, including rings, cones, and cylinders. But processes begin conceptually from the drawing. 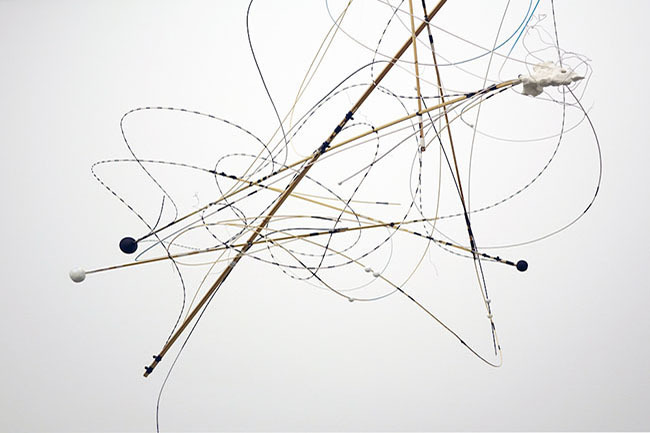 And both are concerned with using drawing to aid in the fathoming of space. 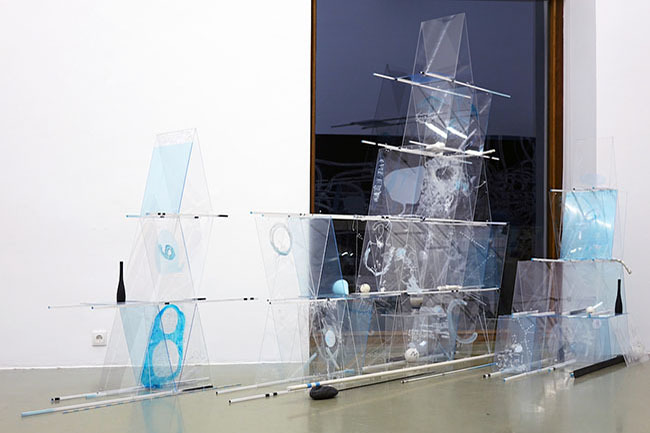 In her spatial drawings, Monika Grzymala begins from a previously created concept, a conceptual model, but the definitive determination of her work occurs in the process of creation. The drawings arise from the body and its proportions. No gesture or movement is repeated; no corrections are made in the line once drawn. In this, not using color facilitates the finding of form. 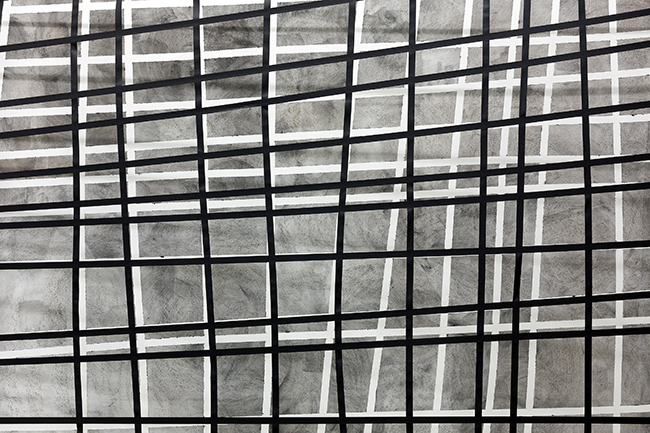 For Grzymala, it is important to state the length of the adhesive tape used as the distance covered best describes the mental and physical processes while drawing. 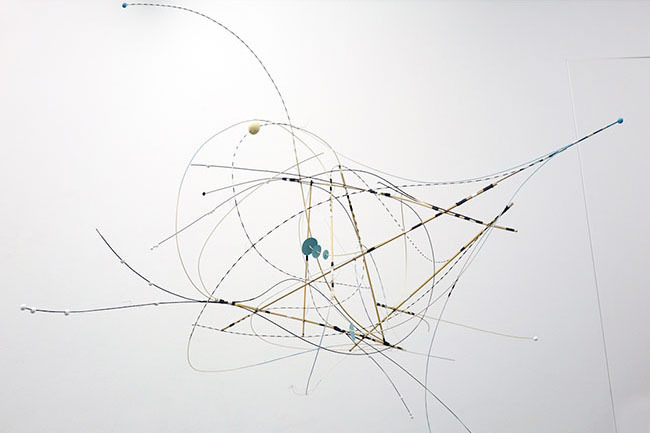 The space determines the drawing and the drawing defines space, or rather, forms its own space within it. 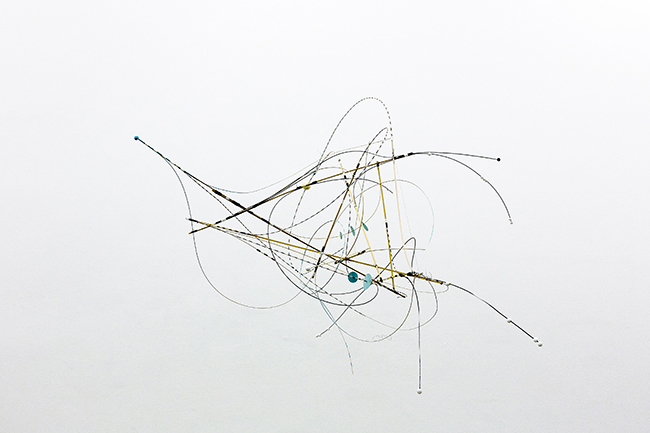 With his works, Nikolaus Gansterer has already moved in the charged field between art and science for quite some time, approaching both with his own methods. In the course of this, drawing is a chance to make thought processes visible, and mediate between perception and reflection. 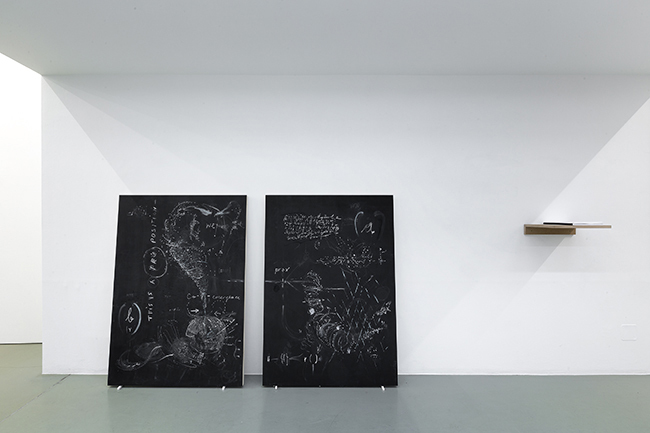 For Gansterer, the desk becomes a drawing lab of sorts, where he develops a series of experimental settings. Together with the philosopher Erin Manning, in the video Translecture on Minor Gestures he traces the complex choreographies of visual thinking. 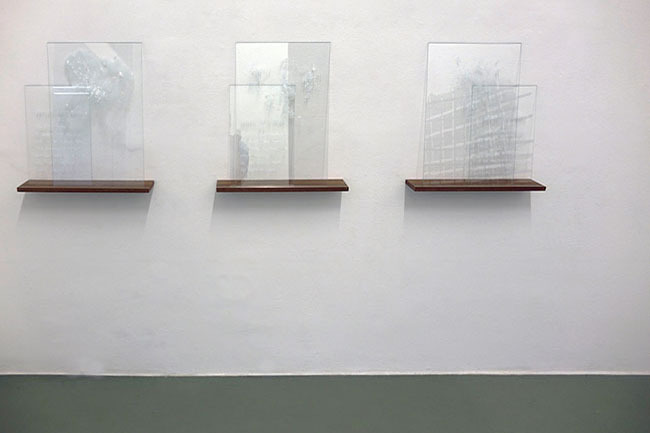 These inner epistemic processes become steadily materialized in the form of fragile installations and mobile objects and are thus translated back into the space. What interests him is the process of the emergence of form. 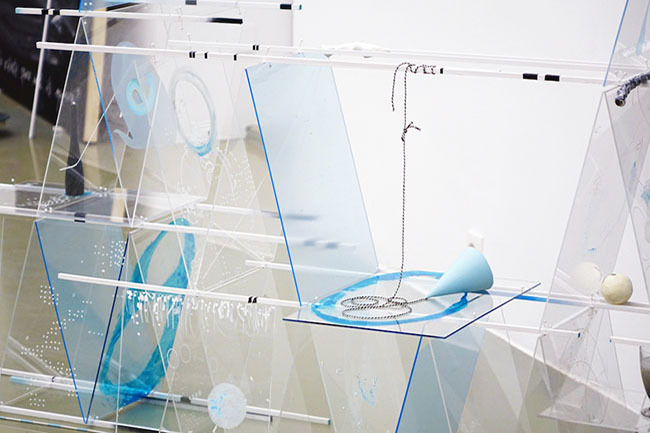 Playing a key role in the work of both artists is the performative act, in which they also let beholders participate; such as when Monika Grzymala publicly dismantles her spatial drawings or when Nikolaus Gansterer performs with the instruments from his lab bench in front of an audience, while at that moment first linking thought, behavior, and drawing. In their work, both artists display concentration and precision. 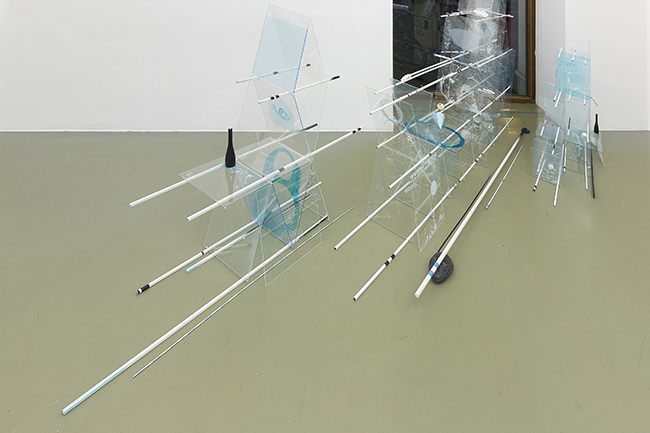 In “Proxemia – Another Co-Creation of Space,” Monika Grzymala und Nikolaus Gansterer appropriate the exhibition space, each using her or his approach, sounding it out through their gestures and actions, mutually giving and taking space, that is, interacting nonverbally with one another. The space becomes an experimental environment. – Interview with Nikolaus Gansterer by Michael Wuerges, in: "In the Studio", Collectors Agenda, Online (17.11.16) or download as pdf (in English) or as pdf (in German). 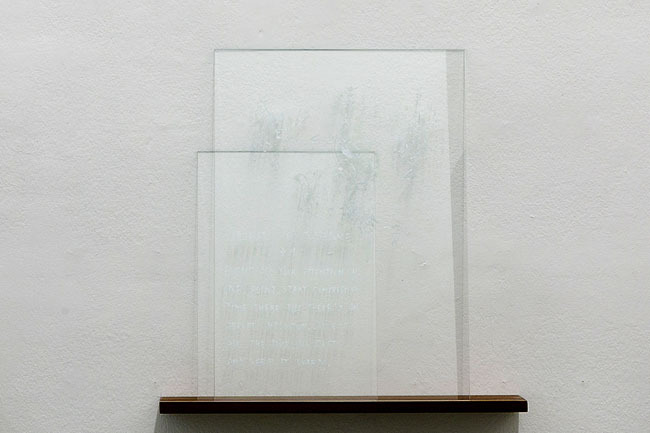 Title: "Proxemia – Another Co-Creation of Space"
A collaboration between Nikolaus Gansterer and Monika Grzymala. at Gallery Crone Vienna, Austria. 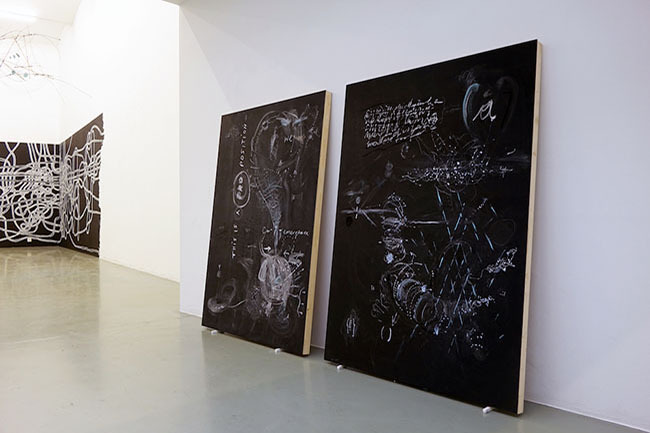 Artist talk: 18 November 2016, 18:00: Monika Grzymala and Nikolaus Gansterer in conversation with philosopher Arno Boehler.